This is a very versatile & tasty salad, that can be served for dinner alongside a piece of steak or a chicken breast, or impress your friends by taking this to a BBQ. 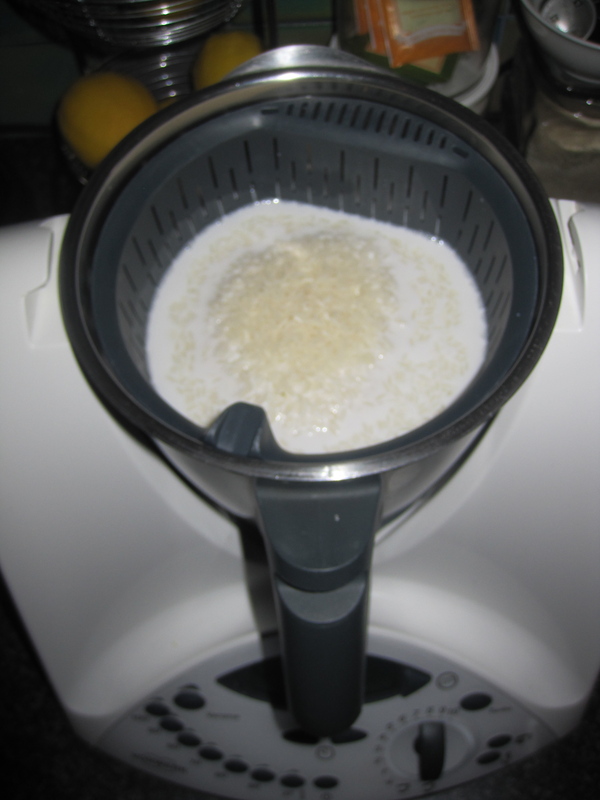 Brown rice is so easy to cook in the Thermomix & can be cooked up to a day in advance to save time on the day. This will last a few days in the fridge, even once it’s been dressed, so keep the left overs for lunch. The best thing is you can add anything to this salad, whatever you have in the fridge or pantry. The only things I recommend not to leave out are the currants – they give the salad a lovely sweetness with every mouthful & diced celery gives it a lovely crunch. 1) place 1.2 Litres water in TM bowl. Insert rice basket, zero scales & weigh rice. 3) Use spatula to remove rice basket & tip rice into serving bowl. Place in the fridge to cool. 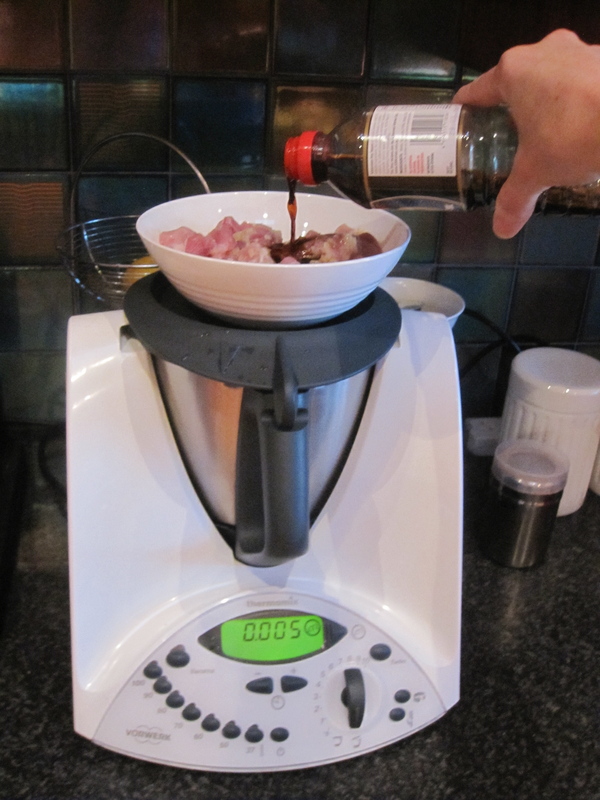 4) Add all other finely chopped ingredients to cooled rice. Place dressing ingredients in a small bowl or cup. Stir to combine & pour over salad. Toss salad so all rice is evenly coated in dressing. You can add anything to this salad – Capsicum, baby spinach, mushrooms, coriander, mint or shredded chicken. You can even add to the dressing – honey, ginger, lime or garlic. I chose to hand chop ingredients for this, as it’s nice to have the same shape for all ingredients that are not too small. 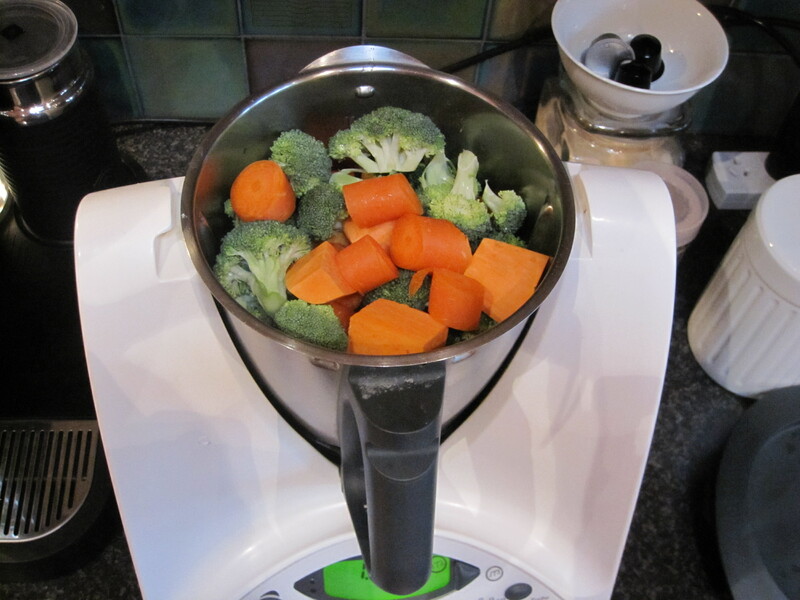 You can chop in your Thermomix if you prefer. These Hot Cross Buns are delicious! 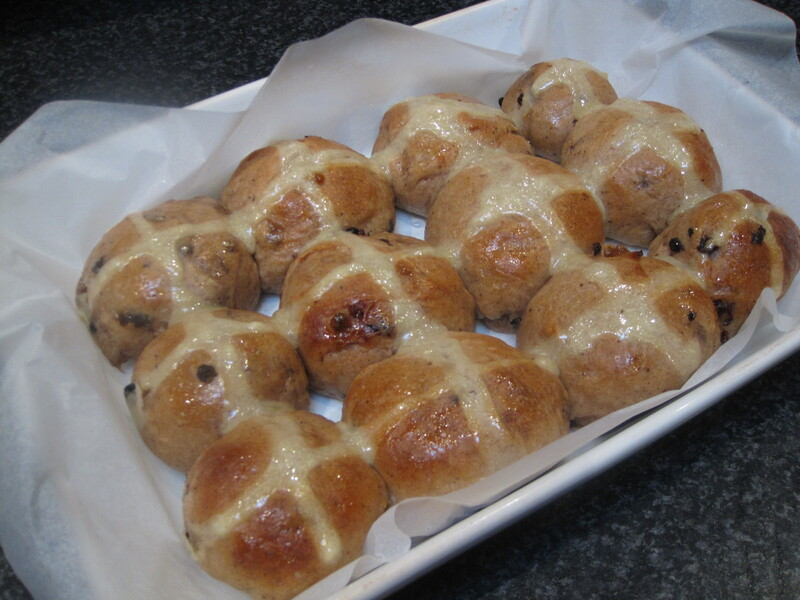 There is not a great deal of difference between the Thermomix hot cross bun recipes you’ll find on the internet, but my recipe is a mish mash of the ‘Everyday Cookbook’ recipe & the Chocolate Hot Cross Bun recipe from ‘Devil of a Cookbook’. The secret is letting them prove for at least 2 hours before baking. You could even let them prove all day (the longer the better). Ideally, you would make the dough in the morning, allow it to prove, shape the buns & allow them to prove again, then bake in the afternoon. This would be a great activity to do with the kids on Good Friday. 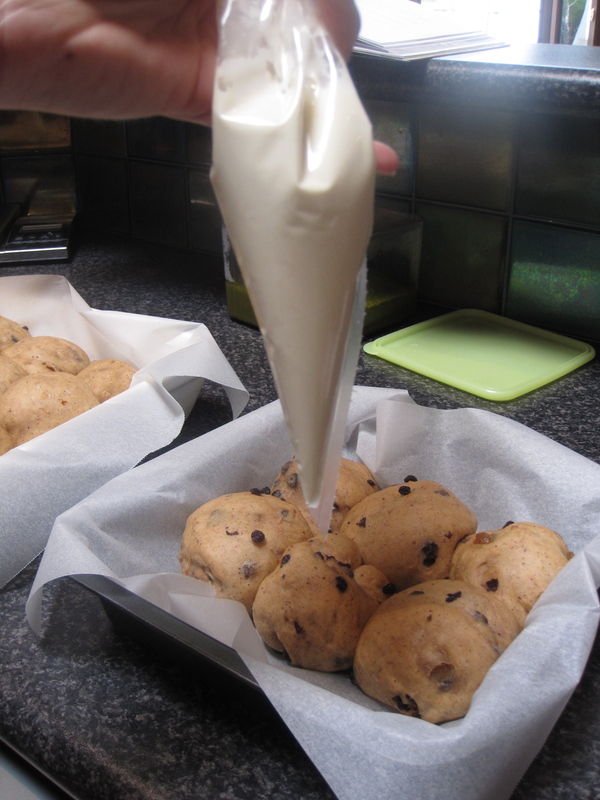 To make Choc Chip Buns, substitute the sultanas & currants in step 3 with 150g choc chips. I usually prove my dough in a ThermoMat on top of my ThermoServer full of boiling water (see notes), however, I don’t do this for the chocolate buns, as the choc chips will melt. Instead, I’ll prove the dough in a warm place or in my oven that has reached 60 degrees then turned off. Also add 20g cocoa & 20g water to the piping ingredients. 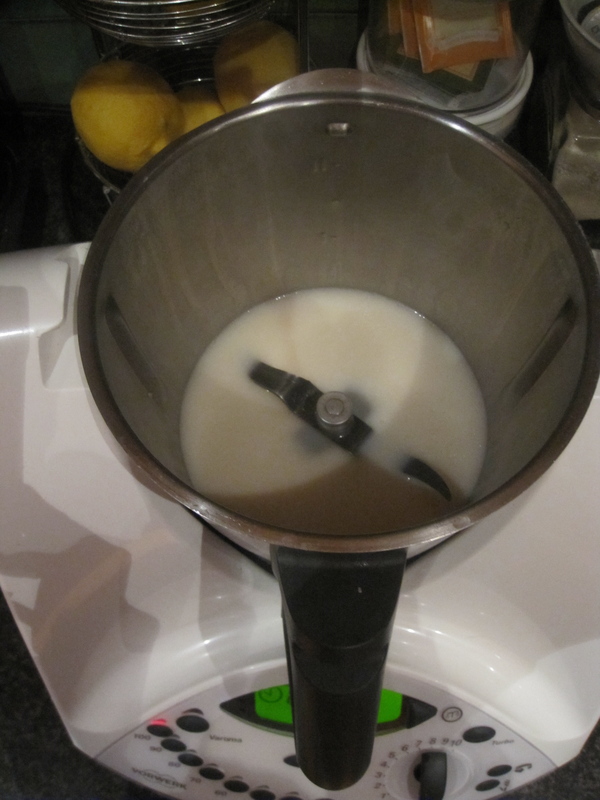 1) Place milk & yeast in TM bowl, heat 1 minute/37 degrees/speed 1. 2) Add flour first & then remaining ingredients, except for sultanas & currants. Mix 6 seconds/speed 7, then knead 5 minutes. 3) Add sultanas & currants, knead for 1 minute. 4) Transfer dough onto Thermomat & work into a ball. 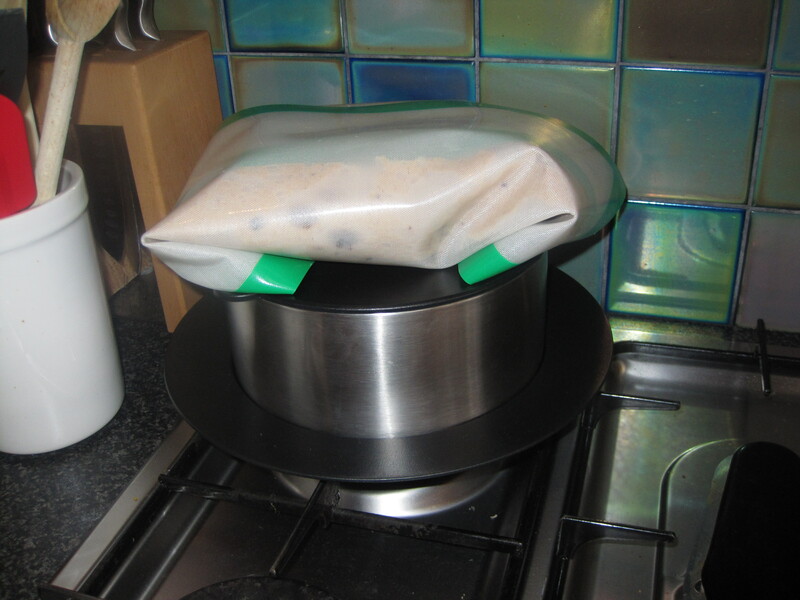 Wrap dough in Thermomat & allow to prove in a warm place for 1 hour or until double in size. 5) Flatten dough into a large square, approx 3-4cm high. Cut dough into 16 bun pieces. 6) Take each bun & pinch diagonal corners to the middle of bun underside, forming a rounded top. Place buns on a tray lined with baking paper & allow to prove & rise for at least 2 hours. 1) Place all piping ingredients into clean mixing bowl, mix 30 seconds/speed 4. 2) Pour into a piping bag & pipe crosses onto the top of buns. 3) Bake for 12-15 minutes, or until golden brown. 1) Place water & sugar into clean mixing bowl, cook 2 minutes/100 degrees/speed 4. 2) Brush buns with hot sugar syrup as soon as they come out of the oven. 3) Allow buns to cool for 5 minutes, before serving, or transferring to a wire rack to cool. I keep a container of sugar syrup in my fridge, that I use for cake & biscuit decorating using fondant. Syrup will last for a long time in the fridge – at least a year. 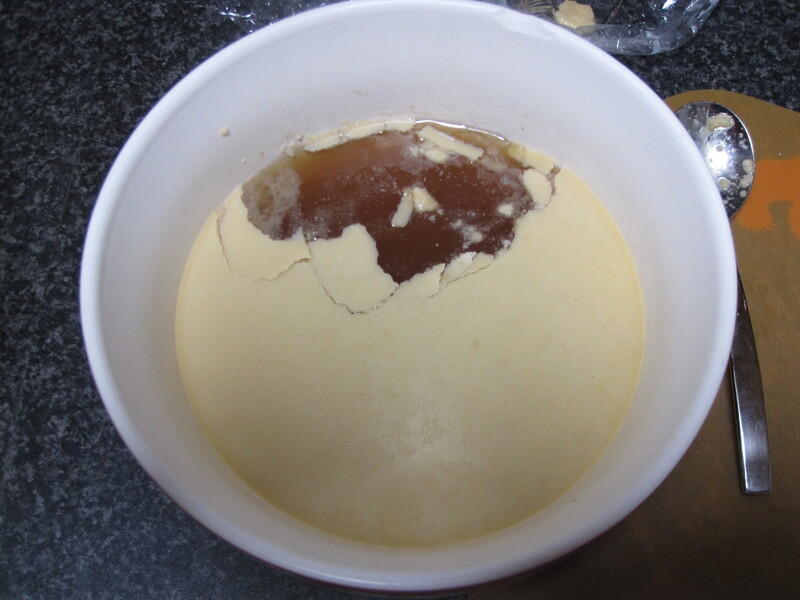 For the hot cross buns, I just pour a little syrup into a bowl or coffee mug & heat in the microwave for 20 seconds. If you’re planning to make a few batches of buns, make all the syrup at once, to save you some time later. For a while now, people have told me about this dish by Jo Whitton from Quirky Cooking. 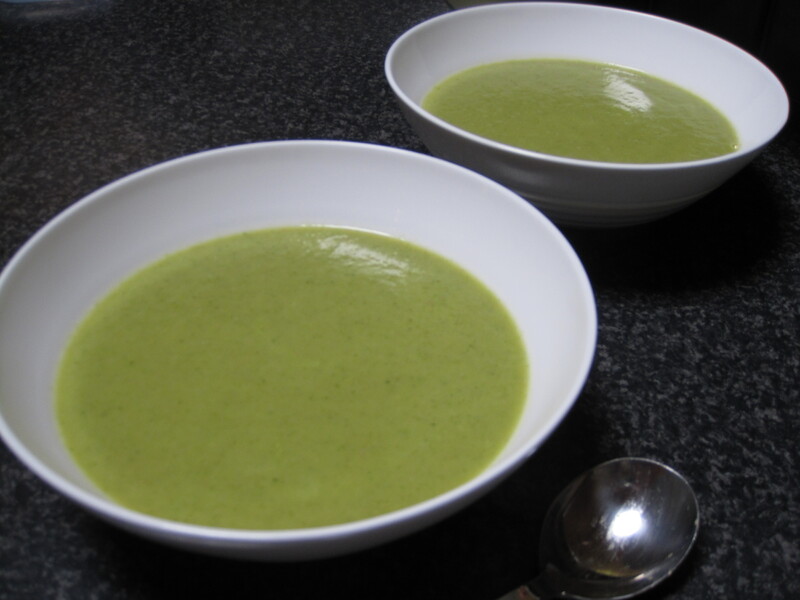 It’s probably one of the most famous & talked about dishes in the Thermomix community. Of course, I had to try it, with the view to share with my customers & on my blog. I love to share not only my own recipes, but other people’s too & of course I will always give full credit to the recipe’s source. I just hope I inspire you to cook! I made this dish at a demo last week to rave reviews! No one could believe how delicious & easy this is. One guest said it was just about the tastiest thing he’d ever eaten! It really does live up to it’s reputation. In sharing the recipe with you, I’ve just cooked it a little differently to Quirky Jo. If you have a chance to visit the Quirky Cooking website, you’ll see that Jo doesn’t measure all ingredients. She will often throw in a handful of this & a few handfuls of that. Some people love to cook like this, but for those of you who don’t feel confident in doing this, I’ve included quantities for all ingredients. I really do hope you try this dish. It may seem daunting at first, especially if you have not used your Varoma much, but trust me, the next time you make it will seem much more simple. 1. Place cubed chicken in a bowl, set aside. 2. Add garlic & ginger to TM bowl. Chop 3 seconds/speed 7. 3. Add garlic & ginger to chicken. Weigh bowl on top of TM lid & zero scales. Add soy & sesame oil to chicken. Stir & set aside. 4. Without cleaning TM bowl, add coconut cream & water. 5. Insert basket & weigh rice. 6. Set Varoma in to position. 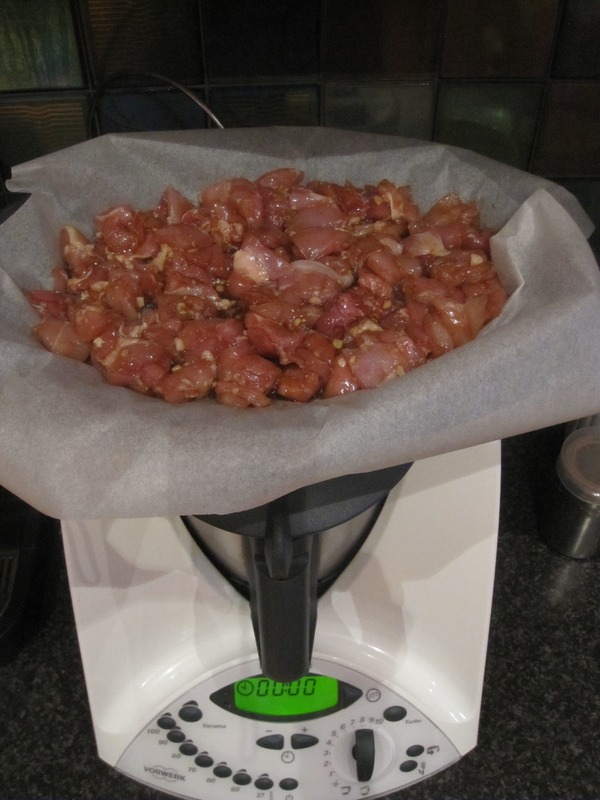 Place a sheet of baking paper on Varoma tray & add chicken. Cook 16 minutes/Varoma Temperature/Speed 4. 7. Using your spatula, remove the rice basket & place rice in Thermoserver to keep hot. 8. Set Varoma back into position & cook chicken 6 minutes/Varoma Temperature/Speed 4. 9. 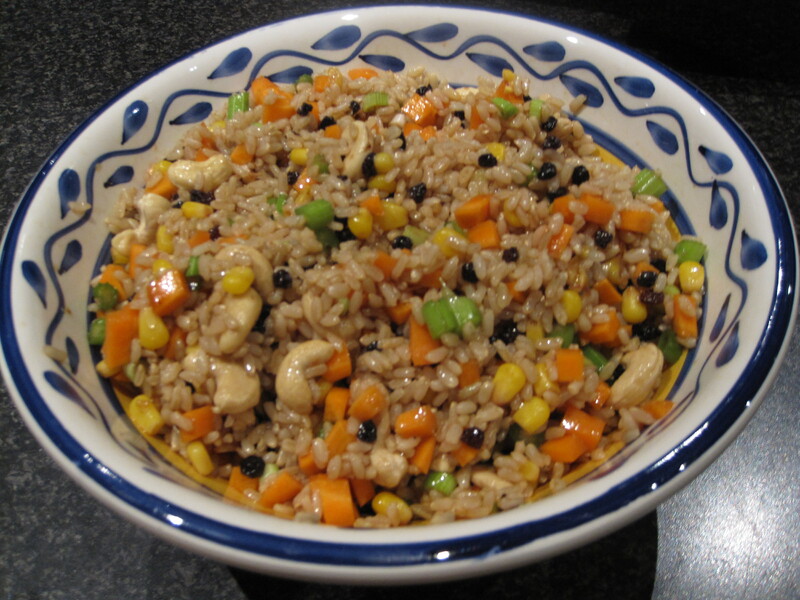 Add vegetables to Varoma Dish, top with cashews & sesame seeds & cook 6 minutes/Varoma Temperature/speed 3. Leave the Varoma tray in place with the chicken still cooking. 9. Check that chicken & vegetables are cooked. There will be some soy sauce & water from the chicken cooking in the Varoma tray. Carefully strain this off, as it’s not required. Transfer chicken & veggies to Thermoserver to keep hot. 10. Add remaining satay sauce ingredients, to the juices left in the TM bowl. Blend 1 minute/speed 9. This is the juices that is left from the coconut cream & water after it’s evaporated while cooking the rice, chicken & veggies. 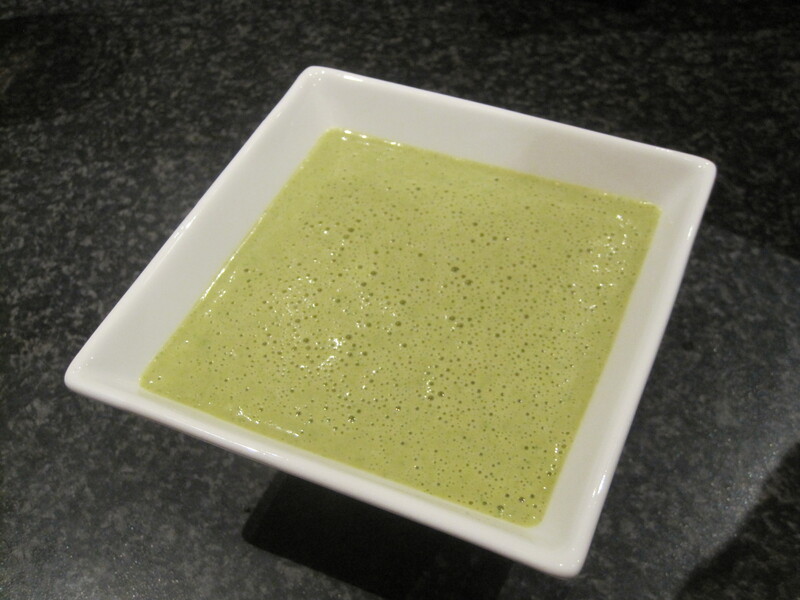 This is the coconut satay sauce after all ingredients have been added & blended. This is a pouring consistency & is beautifully light & fluffy. 11. 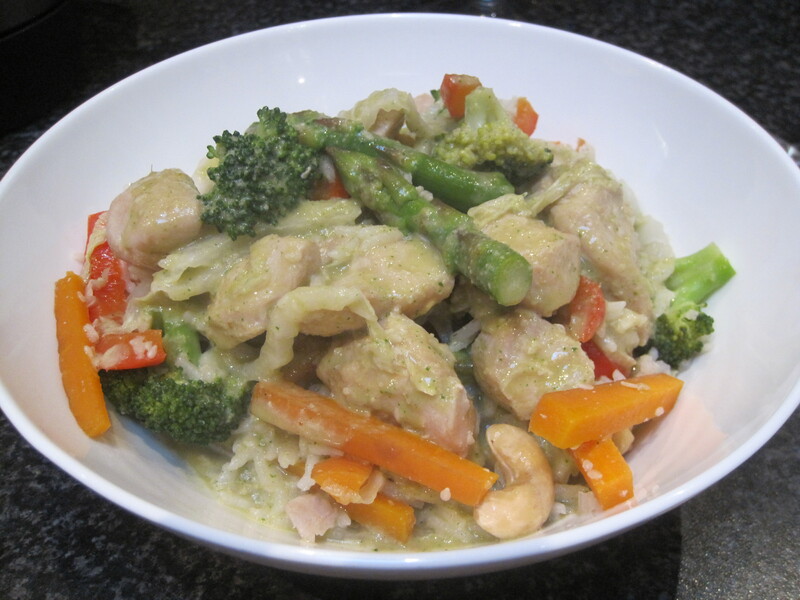 Serve rice, chicken & veggies in bowls & pour satay sauce over the top. Garnish (optional) with finely chopped spring onions & additional sesame seeds. Freeze left over satay sauce to our over fried rice or to flavour any dishes you like. This sauce is far too delicious to waste any of it! You can use light coconut cream in step 4 if you prefer. Substitute soy sauce for tamari for a gluten free option. The kids dinner time in our house, sees two very different eaters at the table. My 4yo has very plain tastes & turns her nose up at anything too fancy or that in any way resembles a vegetable. On the other hand, my 18 month old will eat absolutely anything & devours whatever I feed her. 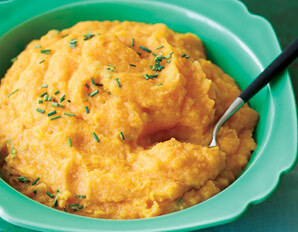 I started to make this vegetable mash when my eldest was about one year old & my kids still eat it! You can use any vegetables to make this. I’ve just adapted the Mashed Potato recipe from the EDC. 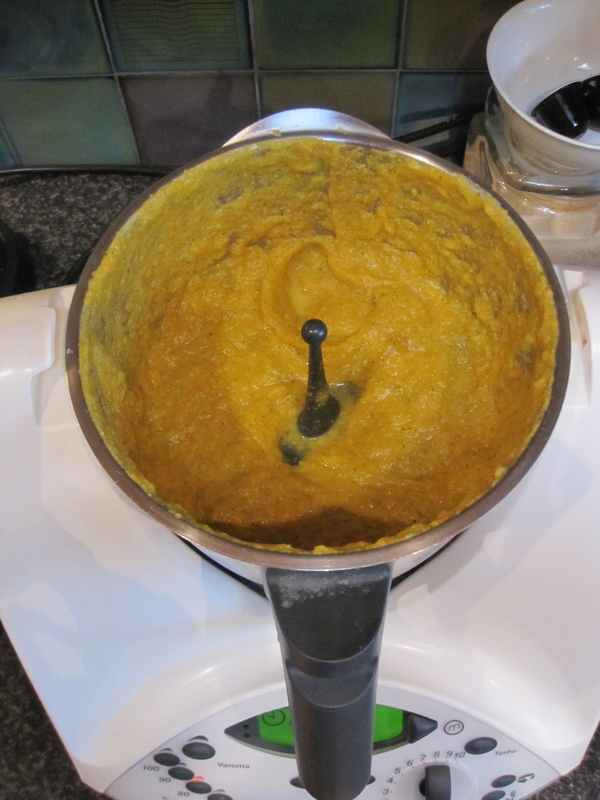 I usually do equal quantities of pumpkin, sweet potato, carrot & broccoli. If I have some, I might throw in a potato as well. This mash is delicious & rich, thanks to the milk, butter & cheese. I’m sure that’s why my kids love it! Of course you can control how much butter & cheese you add for your kids. I don’t mind adding as per this recipe – at least they’re eating vegetables! Amazingly, my 4yo asks for mashed ‘bedgies’ to be served with dinner almost every night! It’s fantastic if I just have sausages, or hamburgers or a chicken schnitzel. 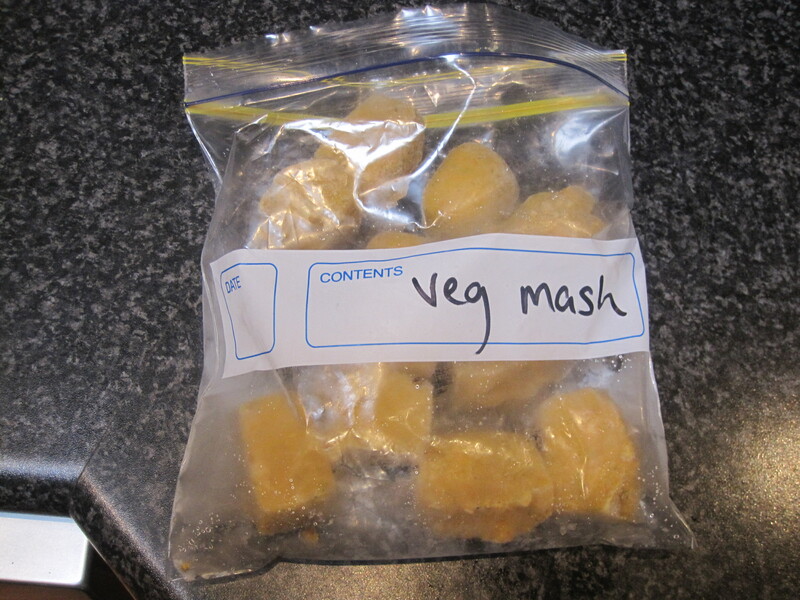 At least if I can defrost a few cubes of veggie mash, it makes it a healthier, more balanced meal. I’m confident that even the most discerning vegetable spotters will eat this. 1) Place parmesan in TM bowl, grate 10 seconds/speed 9. Set aside. 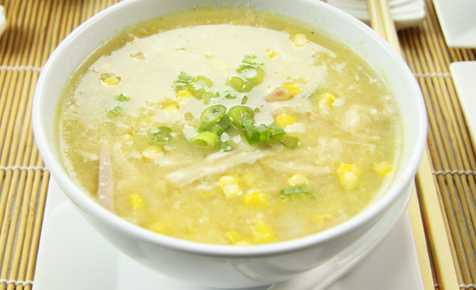 2) Place vegetables & milk in to TM bowl. Cook 25 minutes/100 degrees/speed 1. 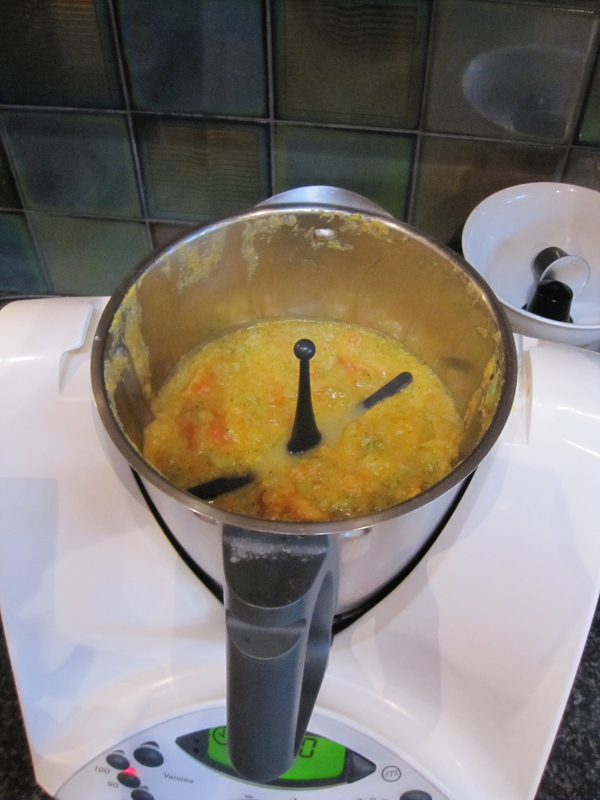 3) Insert Butterfly, by pushing in in the bowl, through the food. Add butter & cheese. Mash for 30 seconds/speed 4. Look at the difference in texture after the butter & cheese is added. Most of the credit has to go to the Butterfly though. It really makes the most creamiest mash ever! 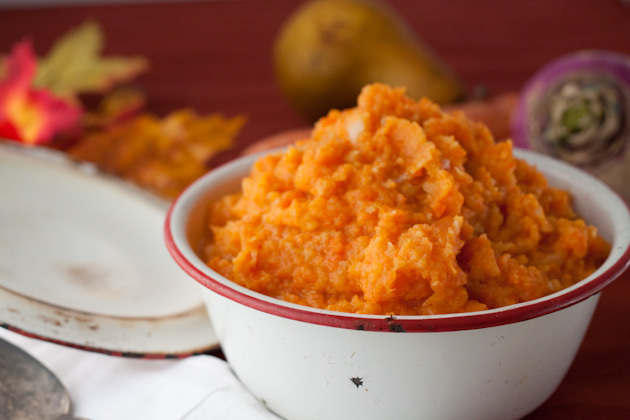 4)Serve as a side dish & freeze in an ice tray or containers for future use. Once frozen, I store my veggie cubes in a zip lock bag in the freezer.